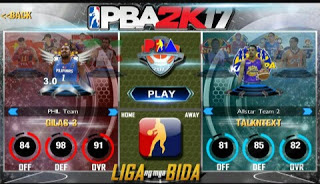 To all basketball 🏀 game lovers, PBA 2K17game is now available for your Android tablets which absolutely free and offline mode. The Philippine Basketball game is loaded with good graphics, sound background and dribbling techniques. This version is currently the latest 2.2. √ Added New Scored Board for better view. √ The PBA rooster have being updated to the current one. √ The basketball court has new background colors, banner, and text etc. √ After extracting the file, run the game in your app menu and play.